Last weekend my friends and I pigged out as usual and went to feast on Japanese hamburgers. It was only natural that we follow up dinner with dessert and so we decided on Korean shaved ice. 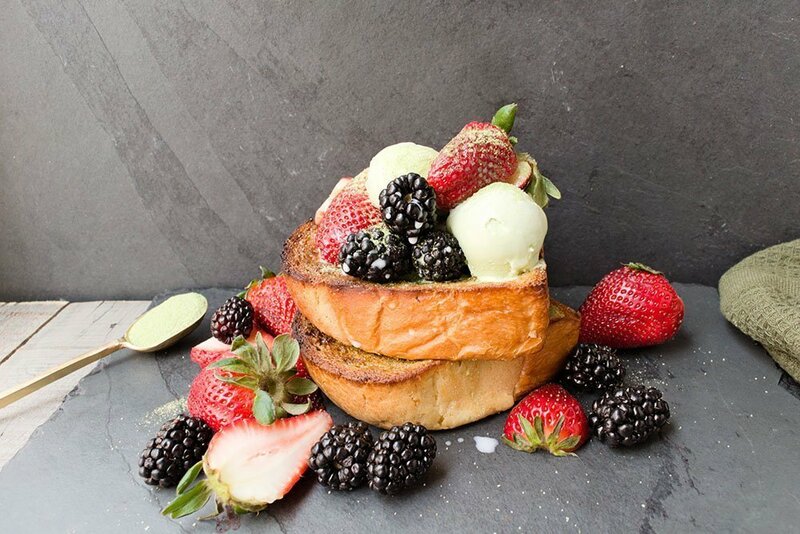 We had already decided on sharing two shaved ice but my eyes wandered over to the brick toast menu and I got suckered in. Two large shaved ice with an order of brick toast for 6 people? Challenge accepted. Needless to say, everything was devoured despite the brick toast being very disappointing. How can such a simple dessert be so mediocre? Still unsatisfied one week later, I decided to make my own. 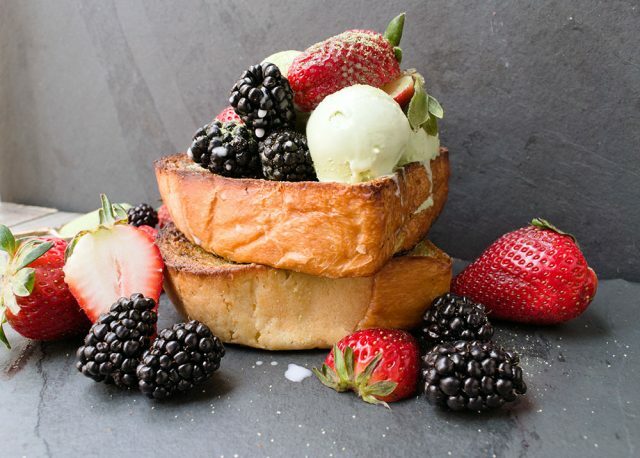 Here’s my matcha brick toast with fresh berries ready in 10 minutes and infinitely better than some cafes (trust me). Cut milk bread loaf into 2-inch thick slices. Combine softened butter with honey and spread on one side of the bread. Sprinkle matcha powder evenly on top of the honey butter. Bake in the oven for 5 minutes or until golden brown. Remove from the oven. 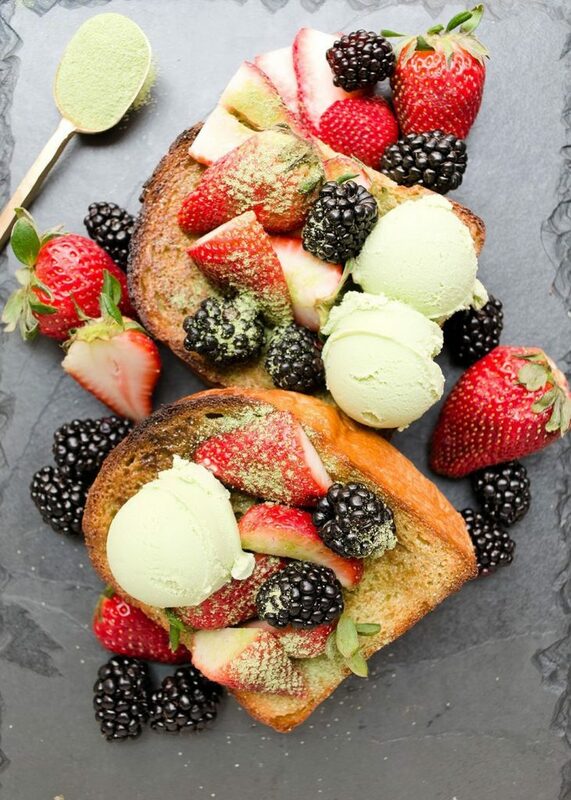 Top each toast with fresh berries and matcha ice cream. Sprinkle matcha powder on top and serve immediately. 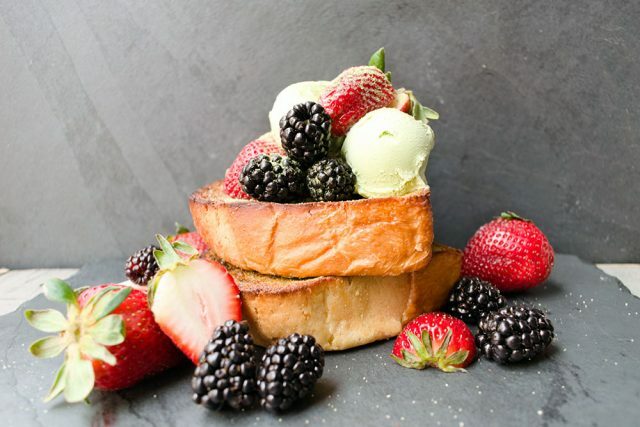 Okay so at this point you may be wondering, “What exactly is brick toast?” Brick toast is an Asian dessert or snack consisting of thick bread slices slathered in sugar and butter and topped with whatever your heart desires. Red bean, Nutella, mounds of whipped cream, ice cream, fresh fruit, crushed Oreos, when I say whatever your heart desires, I wasn’t lying. Start with the bread. 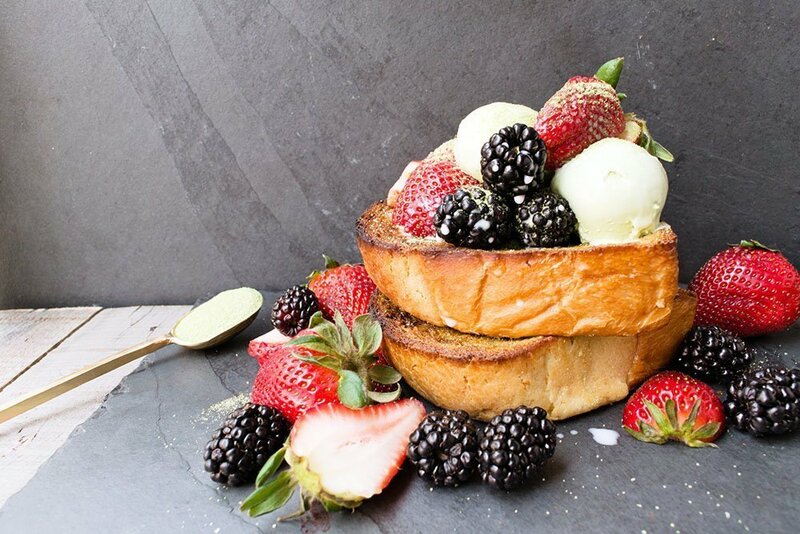 Milk bread is the best choice for brick toast because of its soft texture. It can be found in most Asian bakeries and markets. Find a whole loaf so that you can cut the slices yourself. You will need extra thick slices to hold the weight of the toppings. If you can’t find milk bread, white bread will also work. Mix together softened butter with honey and spread a generous amount on one side of the bread. Usually, it is not recommended softening butter in the microwave because it will be too soft. In this instance, I say go for it. You want it to be soft enough to mix easily with the honey but not completely melted or it will be more difficult to spread an even layer. Sprinkle matcha powder on top and toast the bread just until the top gets nice and caramelized. The toaster oven also works great for this brick toast. 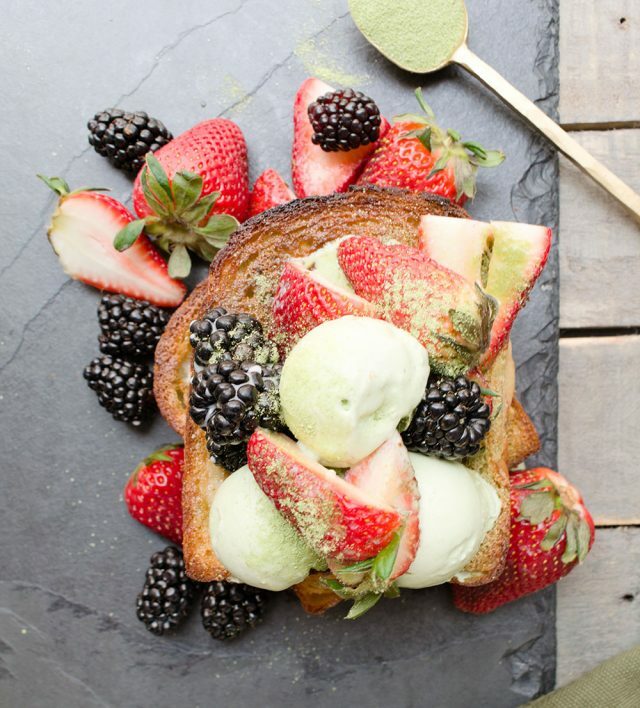 Take out the toast and top with fresh berries, matcha ice cream and sprinkle more matcha powder on top. If you want it to be a truly Asian dessert, drizzle condensed milk on top (sounds crazy but it’s so good). 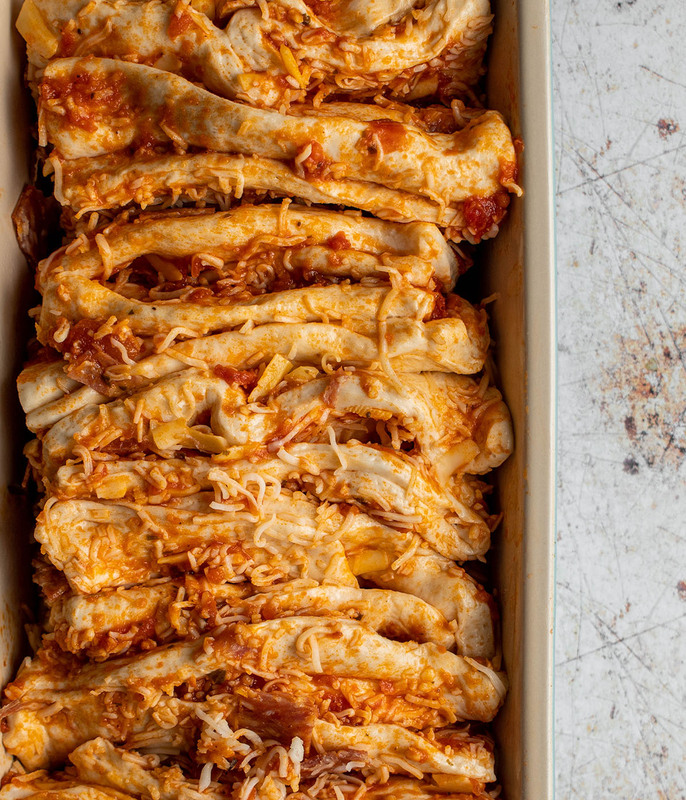 Grab a knife and fork and dig in. 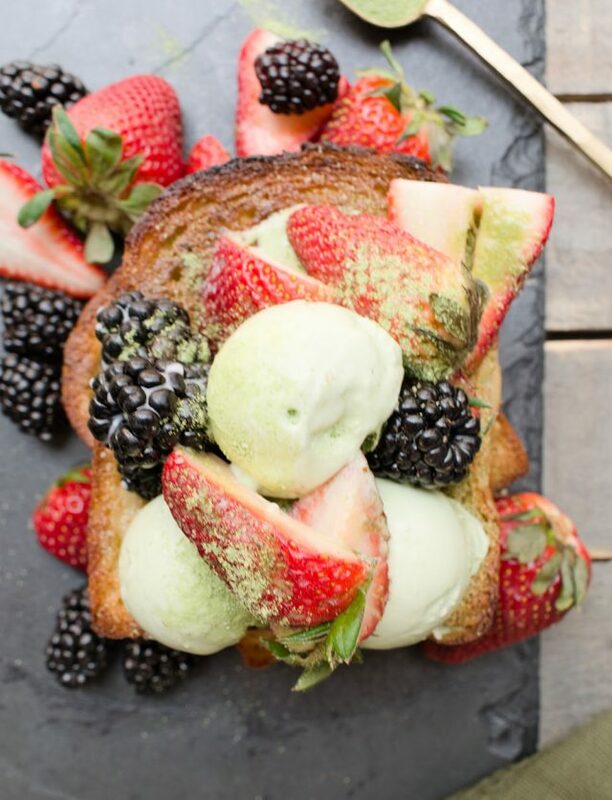 This matcha brick toast my friends is just so delicious. 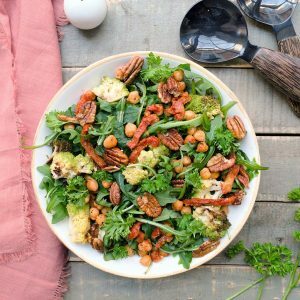 Takes ten minutes to make and tastes better than restaurants? How can you say no to that? Excuse me while I have another toast.